...... encoding, detection of encoding errors), plug-ins, syntax highlighting (including embedded scripts in HTML, ASP, and PHP files), drag-and-drop, and menu and keyboard customizations. 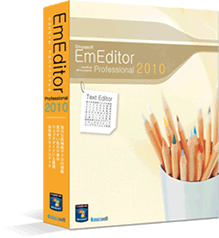 EmEditor Professional also includes portability options (such as USB drive setup) through an Import/Export wizard, as well as virtual space mode, wrap indent, tabbed window design, vertical selection editing (to allow the simultaneous editing of text in multiple lines), binary editing, smooth scroll, a theme feature for color settings, and crash auto-recovery. Qweas is providing links to EmEditor Professional 11.0.4 as a courtesy, and makes no representations regarding EmEditor Professional or any other applications or any information related thereto. Any questions, complaints or claims regarding this application EmEditor Professional 11.0.4 must be directed to the appropriate software vendor. You may click the publisher link of EmEditor Professional on the top of this page to get more details about the vendor.